TWO COLLIE PUPPIES are now ready for rehoming after being thrown in a drain in Roscommon and abandoned. The pups were discovered when a member of the public heard cries coming from a fertiliser bag in a drain in Ballydangon. They could not reach the bag and called local gardaí, who found the two pups inside the bag. Garda Alma Delaney and Garda John Duggan brought the puppies back to the station where they were named Thelma and Louise, given a bath, food and a warm bed in a cell for the night. They were then brought to the ISPCA’s national animal centre to recover from their ordeal and the ISPCA said today that they are now ready to go to a new home. Inspector Karen Lyons said the puppies are “very friendly” and seem to be well socialised. “I find it impossible to understand why anyone could do such a thing to these two beautiful pups when there are options out there for people,” she said. Anybody with any information is asked to contact the ISPCA on 1890 515 515 or Roscommon Garda Station. 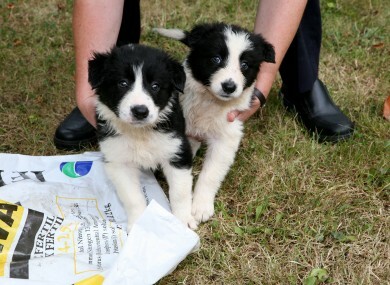 Email “Collie pups tied in fertiliser bag and dumped in drain”. Feedback on “Collie pups tied in fertiliser bag and dumped in drain”.